Andrea J. Loney’s picture book Bunnybear (Albert Whitman & Company) is about a bear who believes in his heart that he’s really a bunny. Her debut picture book Take a Picture of Me, James Vanderzee! (Lee & Low Books), is the 2014 New Voices Award-winning picture book biography of the legendary black photographer of the Harlem Renaissance, and her third picture book Double Bass Blues shares the adventures of a young black boy carrying his double bass home from school (Random House Knopf, 2019). 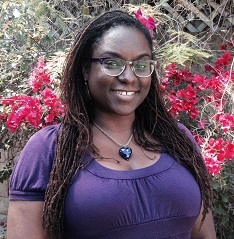 A community college instructor with an MFA in Dramatic Writing from New York University, Andrea is also a proud volunteer for Reading to Kids and the We Need Diverse Books campaign. She lives in sunny Los Angeles, California with her devoted family, embarrassingly spoiled pets, and towering stacks of picture books. Visit her on the web at andreajloney.com.